City of Bulgaria, on the southern bank of the Danube. It was founded by the Russians in 968, was occupied in turn by the Greeks and the Bulgarians, and was finally captured by the Turks under Bayazid I. in 1389. Jews are known to have gone to Rustchuk for commercial purposes from different points in the vicinity of the Danube in the early part of the eighteenth century; but they did not take their families with them. The foundation of the present Jewish community dates from 1792, when some natives of Belgrade, which city had been captured by Emperor Joseph II. of Austria in 1788 and retaken by the Turks in the following year, sought refuge in Rustchuk to escape the reprisals of the latter. The first chief rabbi of the city was Abraham Graziani (1800-6), who drew up a code of regulations and obtained the grant of a piece of land for a cemetery, the community being placed under the control of the rabbinate of Adrianople. The Jews of Rustchuk flourished commercially until the Continental blockade; but the sieges of 1807 and 1811 destroyed the prosperity of the community. The Russians converted the synagogue into a stable for their horses, and finally destroyed it by fire, the memory of this catastrophe being perpetuated by the Jews of the city in a popular song entitled, after the Russian name of the war, "Za Vera" = "For Religion." By the time peace was declared, almost the entire Hebrew community had removed to Bucharest; but some time later ten families of refugees returned with several families from Nicopolis and with Graziani, the chief rabbi. Graziani, although he made some much-needed reforms, was removed from office in 1814. His successors were Solomon Capon (1814-20); Shabbethai Behar Abraham (1822-35); Jacob Yom-Ṭob b. Abraham, called Baïram (1835-46); Benjamin Pinto of Bosnia (1864); Abraham Melammed (1869), the first rabbi of Rustchuk to bear the official title "ḥakam bashi"; and A. Salonicchio, the present (1905) incumbent. The War of Greek Independence in 1828 drove several thousand Mohammedan emigrants from Rumania to Rustchuk; and a Jewish resident named Perez Alkalai generously provided the fugitives with all necessary supplies, receiving as a reward a "berat" from Vali Pasha which exempted him permanently from all taxation. In 1837 and 1845 the city was visited by the sultans Maḥmud II. and 'Abd al-Majid respectively, and the Jewish congregation was the object of the imperial bounty. The community of Rustchuk, which is the most prosperous in Bulgaria, possesses an excellent library, which is a legacy from Chief Rabbi Shabbethai Behar Abraham; and the family of Rosanes also has a library containing some rare works. The first rabbinical author of the city was Elijah Ventura, originally from Spalato, who wrote a Hebrew work entitled "Kokeba di-Shebiṭ"; the above-mentioned Abraham Graziani composed the "She'erit Ya'aḳob"; while in the libraries are preserved several manuscript works of his successor, Solomon Capon, among them the "Ḳonṭres 'al Re'em." 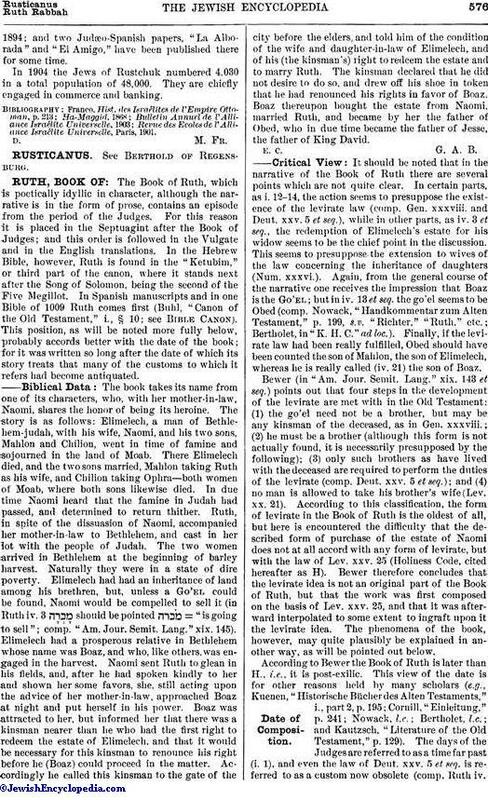 Abraham b. Israel Rosanes (Abir) published in "Ha-Maggid" (1868) an account of his travels in Palestine, while his son Solomon Israel Rosanes, called "Tchelebon," is well known for the researches in the history of the Oriental Jews published by him in various periodicals, such as the "Anuar Penetru Israeliti" (1888, xi.). The city contains two synagogues: one large one, and a smaller one called "Ḳahallah Ḳadosh Shalom." It possesses also two schools, supported by the Alliance Israélite Universelle, with an attendance of 272 boys and 204 girls, as well as a Zionist society, a ḥebra ḳaddisha, a chief rabbi, and a rabbinical tribunal. There is likewise a small Ashkenazic community, which has an oratory of its own. Every ten years the interment of the contents of the Genizah is celebrated with great ceremony. 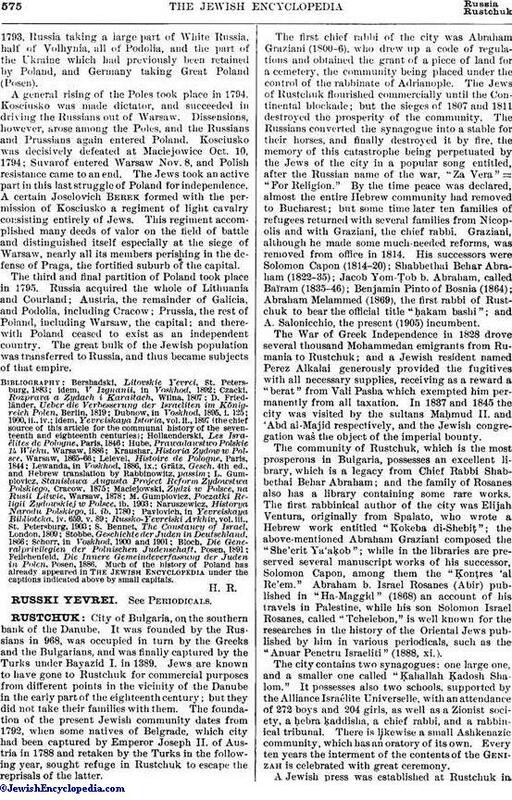 A Jewish press was established at Rustchuk in1894; and two Judæo-Spanish papers, "La Alborada" and "El Amigo," have been published there for some time. In 1904 the Jews of Rustchuk numbered 4.030 in a total population of 48,000. They are chiefly engaged in commerce and banking. Revue des Ecoles de l'Alliance Israélite Universelle, Paris, 1901.